Sitting around anticipating the approaching winter storm, and waiting for the very slow decision to cancel school, the time seemed right for a glass of a good stout. I retrieved the bottle of Dungarvan Black Rock Irish Stout I had received from a coworker a few months ago. We were introduced to the beers of Dungarvan Brewery during our Ireland pilgrimage and I was excited to be able to try another beer from this relatively new Irish craft brewery. Black Rock Stout pours pitch black with a creamy, thick beige head. The head persists and also leaves behind a coating on the sides of the glass. The aroma of coffee and roasted malt come with a touch smoke. The flavor brings to mind coffee, roasted malt and cocoa. There's a hint of sweetness and black licorice in the background. The finish is dry with the taste of roasted coffee lingering behind. A thick and creamy mouthfeel completes the picture. 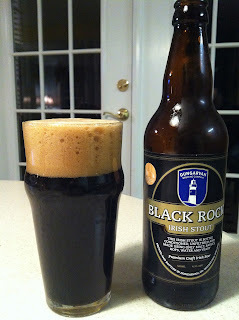 As much as I was looking forward to this beer, I enjoyed Dungarvan Black Rock Irish Stout even more than I expected. Currently, Dungarvan beer is available in Ireland, and is also exported Italy. I hope someday the brewery's bottle-conditioned beers will be imported into the U.S. Meanwhile, I'm going to have to convince my Irish coworker to pack an extra suitcase on his next trip to the States. It's odd to think, less than four months ago I was sitting in an Irish pub enjoying some Dungarvan beers. Drinking this bottle of Irish Stout brings back fond memories. I look forward to cracking open the others.